In today’s interview, Hollywood actor, speaker and health and fitness advocate, William Shewfelt, shares his journey going from a strict vegan diet to a carnivore diet and how it improved his general health and wellbeing. William is very passionate about fitness and nutrition. After high school he was on a search to find a healthier way of eating that would not only improve his acne and some niggling gut issues, but also give him more energy, mental clarity and better overall health. In today’s interview, we get a chance to talk about how after four years on a strict vegan diet (which he researched thoroughly) he was left feeling fatigued. He was hungry all the time and his energy levels were at an all time low. So, after doing some more research he uncovered the ketogenic/carnivore diet and decided to give it a go. If you know someone who is struggling on a vegan diet and is interested in the potential health benefits of making a switch to a carnivore diet, or anyone interested in what the transition would be like, this interview is for them. I enjoyed this interview with William as he shares his experiences with different ways of eating. William having personal experiences, and lots of personal testing research, on both vegan and carnivore diets, is a wealth of knowledge and shares lots of great tips. This goes from how to deal with acne, supplements to try, to how to approach the gym. Most importantly he encourages people to focus on their own goals; experiment, listen to your body and find what works best for you. Special thanks to William for joining me on the show. Enjoy the episode! For more information visit The Carnivore Shredding Program website, or you can follow William on Instagram or YouTube. [00:00] – For $10 off a one to one consult with William go to The Carnivore Shredding website after the interview and enter the code BIOHACKER. [00:37] – Introducing, William Shewfelt, an actor, speaker and health and fitness advocate who is known for his portrayal of Brody the Red Power Ranger on Power Rangers: Ninja Steel. Today we talk about his journey from a vegan to a carnivore diet. [01:42] – Williams interest in the vegan diet began in college when he was looking to a solution to severe acne as well as some gut issues and discomfort. After a lot of research, he came across Dr Michael Greger and adopted a complete whole-foods, plant-based diet; it was rich in flax seeds, cruciferous veggies, leafy greens, nuts and legumes. [04:22] – After four years of following a strict vegan diet (with added vegan supplementation) he found his health was deteriorating. He experienced bloating, had no feeling of satiety, his energy was depleting, and he had trouble focusing. He decided to do some more research on diets and found the ketogenic diet. [07:01] – William explains that the vegan diet did help with his skin, but so did the ketogenic diet. He believes this has more to do with removing inflammatory foods such as vegetable oils, processed carbohydrates and other insulinogenic foods. For help with acne, he also recommends beef liver (which like Accutane is high in vitamin A) and omega-3. [09:31] – Another tip for reducing acne is to try intermittent fasting, which helps reduce insulin throughout the day and aids the process of autophagy. Aerobic forms of exercise also help due to similar effects on the body as fasting; focus on zone 2 cardio such as hiking, biking, brisk walk or light jog (target heart rate: 180 minus age). Lastly, antioxidants have also been found beneficial, so drinking green tea and lemon might help. [12:15] – William explains that while he had some apprehension about what the carnivore diet will do to his health, the research he did reassured him. Rather than slowly transitioning he jumped straight in to the new way of eating, from vegan one day, to carnivore the next, and felt great. [15:28] – When he first transitioned William fasted all day, trained at the gym and ate a single meal of what he believed was a ketogenic diet in the evening. He explains that he lost a lot of weight fast (10 pounds in a week!) from losing water and some fat, but he experienced zero bloating. [18:38] – The hyper-carnivore diet is what William eats now; consisting mainly of red meat and eggs and smaller amounts of high fat dairy such as cottage cheese, hard cheeses and Greek yoghurt. There is also some bacon, poultry and beef liver twice a week. William also occasionally eats low sugar fruit like berries, tomatoes, cucumber, avocados etc. In his words, he eats a high protein, pretty high fat and pretty low carb diet. [20:28] – Currently he eats one to two meals a day and prefers to train fasted. He explains he avoids eating until he feels really hungry and while he is on set he makes a point to ask catering for simple animal protein and eggs. [24:23] – In terms of supplements William takes magnesium (Natural Vitality, Natural Calm) once or twice a day and one or two tablespoons of Carlson’s wild cod liver oil. He also eats beef/calf liver two to three times a week and if he can’t get his hands on some, he will take beef liver tablets. He salts his foods with Himalayan pink salt and will consume extra after a hard training session or a sauna. [29:43] – Will explains how the cooking skills required for this diet are minimal; he cooks the meat in its own fat, or with some butter. He also explains that he is moderating the amount of fat he is consuming as he is not aiming for highest possible levels of ketosis. He consumes 150-200g of protein/day and 100-150grams of fat. He is focused on health, mental clarity and body composition. William’s tip for cooking liver: cook it on lower heat and try not to dry it out. [32:15] – The amount of food necessary completely depends on the amount of anaerobic activity – particularly heavy weight-lifting – that he does. He lifts heavy 3 times a week and, on those days, can consume 2 pounds of meat a day + 8 eggs and some cottage cheese. But generally, he consumes 1-1.5 pounds of red meat, 8-10 eggs, and some high fat dairy, poultry or bacon split into one to two meals. [37:54] – William has done a lot of experimentation with coffee and he found that for him having 3-4 cups of coffee in the morning, with a cut off at 12-1pm, works best. This does not affect his sleep quality and feels great. But everyone is different, and people should find what works for them. [40:00] – William believes people should determine what their goals are and find the optimal level for them. In addition to coffee he drinks water, sparkling water and occasionally some tea. He does not add fat like butter, ghee or other MCT oils to his coffee anymore as he’s not looking for the extra calories. William recommends Dr. Ted Naiman’s graphic showing lowest ad libitum caloric intake and explains that consuming too much fat will stop you from losing body fat. [45:33] – For now, William has found that this is the diet that works the best for him but as we are constantly learning, he will not categorically say that this will never change in the future. Currently, he believes consuming whole foods diet of high-quality animal proteins, healthy fats and low carbohydrates is the healthiest way of eating and the ketogenic/carnivorous version of that gives him the best results. [48:04] – While the low carb diet is not unusual in Hollywood, other actors have noticed the success William has had with the more uncommon carnivore method and have taken it on with great results. 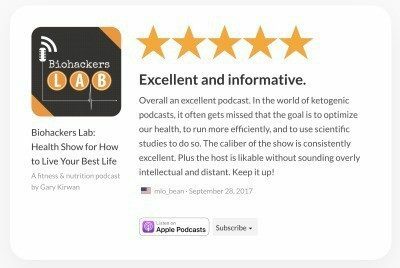 [49:10] – William has published a guide combining everything he learned about fasting, the ancestral diet, the carnivorous diet, the ketogenic diet, nutrition and science behind insulin hypothesis, energy in-energy out, and body composition, as well as the best approach he found to get lean and healthy while maximising performance in the gym. The e-book is on the Carnivore Shredding website where he also offers consults to people wanting to learn more. [50:51] – For other ways to keep in touch and follow William find him on Instagram and in his stories, where he posts a lot of gym stories and food pictures. He also does some YouTube vlogs with behind the scenes footage on what it’s like to be an actor. For people with kids, Power Rangers: Ninja Steel is on Nickelodeon on Saturdays or on Netflix.